Feed your appetite for wordy fun with the award-winning word-puzzle series from PopCap. 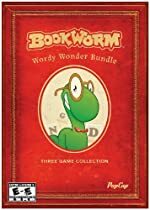 Explore all three vocabularious games — Bookworm, Bookworm Adventures and Bookworm Adventures Volume 2. It’s the ultimate test in vocab valor! Link letters to build words and keep Lex, the hungry bookworm, sated and smiling in the original Bookworm. Then battle your way through books and fight ferocious villains in the epic role-playing word game, Bookworm Adventures. Ready for a bigger challenge? Help Lex save the world from certain doom by building words and battling monsters in Bookworm Adventures Volume 2. It’s the most fantastical fun you can have with an invertebrate!